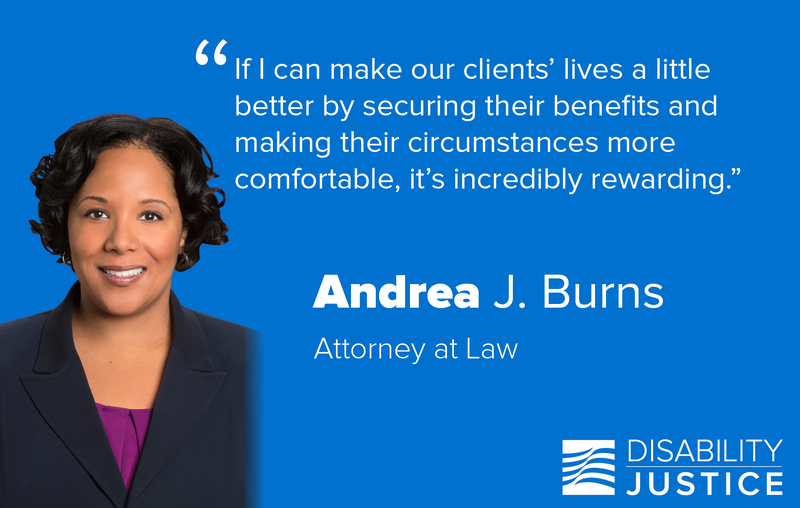 Disability Justice welcomes Ms. Andrea J. Burns as an associate Social Security disability attorney in its Philadelphia office. Throughout her career, she has represented thousands of Social Security applicants at all levels of appeal for Social Security Disability Insurance and Supplemental Security Income claims. Andrea’s passion for helping others fuels her drive to succeed for her clients. After graduating from Johns Hopkins University with a degree in public health, Andrea worked for Community Hope, a non-profit organization that provides housing for those with debilitating mental illness. This experience shaped her desire to pursue law in order to assist those in need. Devoting her practice to Social Security disability was a natural fit for Andrea. Her genuine compassion makes clients feel at ease and allows them to open up about what they’re going through. Andrea can be reached at aburns(at)disabilityjustice(dot)com.